Friday’s session saw the corrective action getting extended as the Markets continued with its modest slide. The benchmark Index NIFTY50 continued to retrace and ended the day with a loss of 61.40 or 0.57%. The session remained relatively less volatile and therefore did not see VIX rising too much. The session also confined itself to a narrow trading range all throughout the day. As we approach a fresh week, stable global environment may see Indian Markets opening on a relatively stable and modestly positive mode. 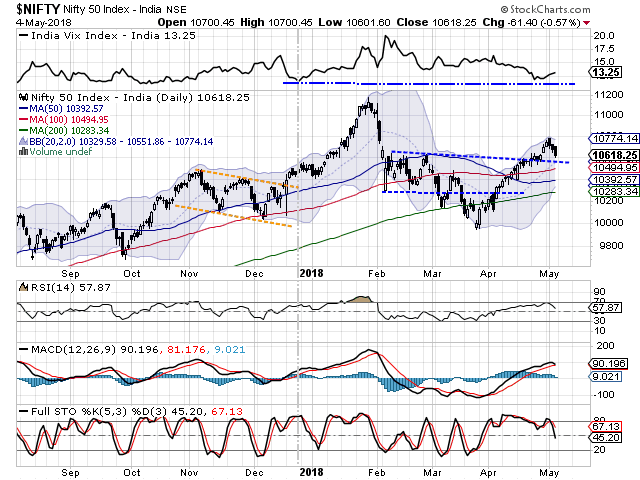 We may also see some technical pullback but speaking on broad terms, we will continue to see consolidation persisting in the Markets with the previous Week’s high acting as major resistance. Monday’s trade is likely to see the levels of 10650 and 10695 acting as resistance. Supports are likely to come in at 10575 and 10540. 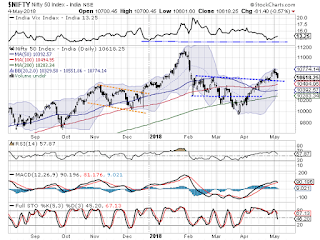 The Relative Strength Index – RSI on the Daily Chart is 57.8654 and it has marked a fresh 14-period low which is bearish. RSI has marked a fresh 14-period low while NIFTY has not done so. This also marks a Bearish Divergence against the price. Daily MACD still continue to trade above its signal line. No significant formations were seen on Candles. Pattern analysis shows that after breaking out from the rectangle formation and testing immediate highs of 10785, the NIFTY has been giving a throwback. It continues to remain in this formation until it forms a higher bottom and attempts to move higher again. Overall, though a positive and stable start is expected on Monday, we will continue to see consolidation persisting at higher levels. The Markets still continue to remain vulnerable to profit taking bouts at higher levels unless the levels of 10785 are breached on the upside. The VIX continue to remain at low levels and this keeps room for volatility to increase in the near term. Though there are no signs as yet that point towards any major downsides. While continuing to avoid shorts, any corrective moves from higher levels should be used to make fresh purchases. Highly stock specific approach with cautious view on the Markets is advised for the day. Relatively better technical setup is observed in stocks like TATA SPONGE, FUTURE LIFESTYLE, GAIL, BOSCH, TV18 BROADCAST, INDIGO, LT FOODS, SRS LIMITED, JMT AUTO and IVRCL.